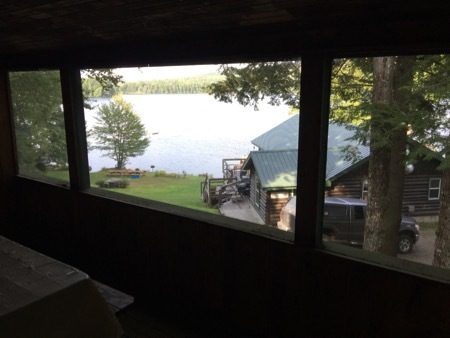 I decided it was time to take my son on a true Maine fishing experience and while doing some research, I came across Eagle Lodge and Camps based out of Lincoln, Maine. I was looking for something rustic with a feel of “yesteryear” but with the added benefits of comfort, some modern amenities, cleanliness, and convenience. This is exactly what I found “online” with Eagle Lodge and Camps. I decided to take a chance and contacted the owners Justin and Loraine to make reservations for three days of fishing. To be honest I was a little nervous. Here I was trying to make a memorable father/son trip and I wanted it to be perfect, and the thoughts of it not being like I visioned kept running through my mind. All that was put to rest right from the first communication back from Loraine and Justin. Eagle Lodge and Camps sits right on the waters edge of Folsom pond and Crooked pond. These two ponds hold Largemouth & Smallmouth bass, pickerel, sunfish and perch. Steven and I fished two solid days up there and we caught a boat load of bass and a couple of feisty sunfish. Before we get into all that, I want to talk about the Lodge and the camps themselves. 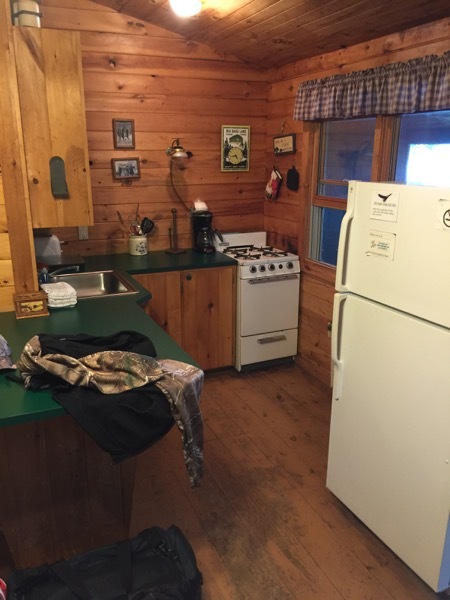 The cabins at Eagle Lodge are rustic cabins built over 100 years ago. Steven and I stayed in the Folsom cabin, and we loved it. 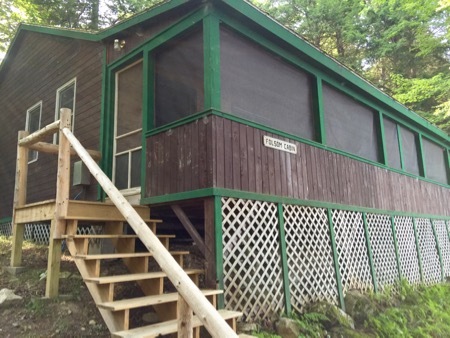 The cabin itself had two bedrooms. One bedroom had a queen sized bed, and the other bedroom had double bunks that could sleep up to six people. This is a perfect cabin for big families. The kitchen and living area was spacious and was equipped with everything needed to cook if you chose. 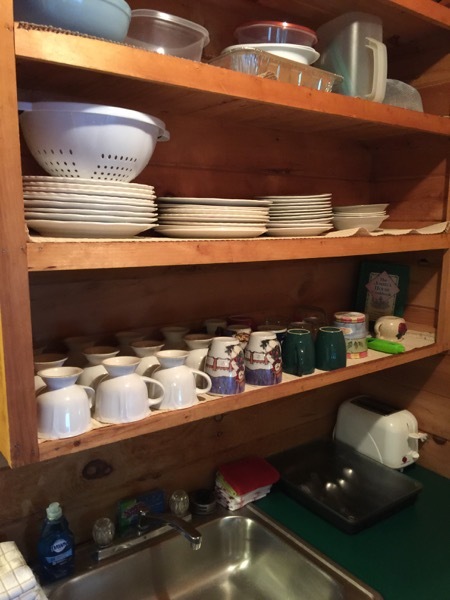 Eagle Lodge does offer an American Plan if you choose to leave all the cooking to them. From what I saw, many guests took advantage of this option. 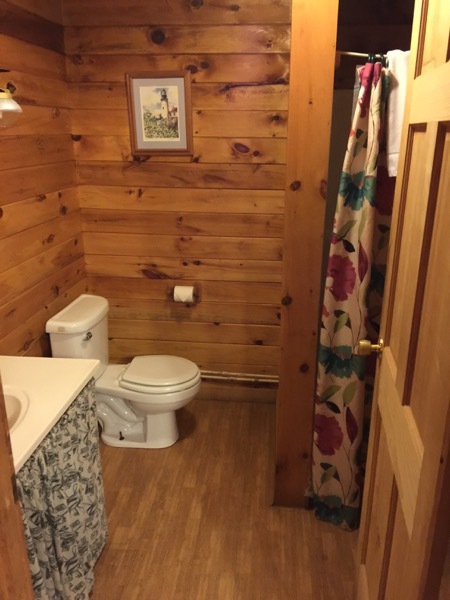 The cabin also had a full bathroom with hot water and was super clean. 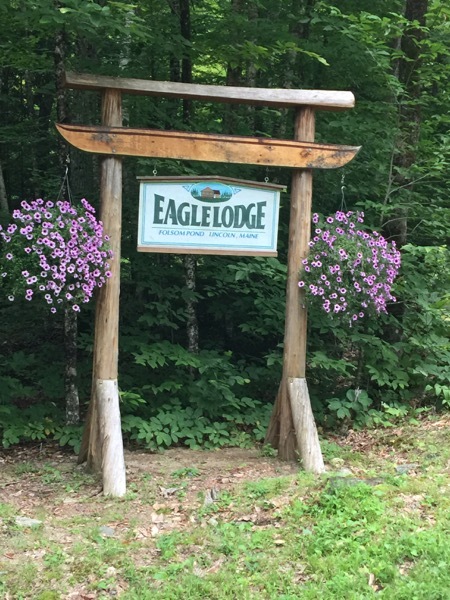 If you are looking for a rustic type of experience with the convenience of all the amenities, clean accommodations, and the ability to have a nice hot shower at the end of the day, then Eagle Lodge and Camps is for you. View from the screened in porch. Awesome or what? Screened in porch, the perfect spot to relax and have a drink or two. Bathroom in the Folsom Cabin! Spacious and clean! Shot of the Kitchen area. Everything needed to cook if you chose to. Walking around the camp and talking to the other guests it became very apparent that this place is very family oriented. We spoke with multiple guests and each one of them have been going to Eagle Lodge and Camps for many years. One particular guest told me they were going to ask about renting a cabin for a whole summer! What does that tell you? It tells me what I suspected all along, that this place is the real deal. 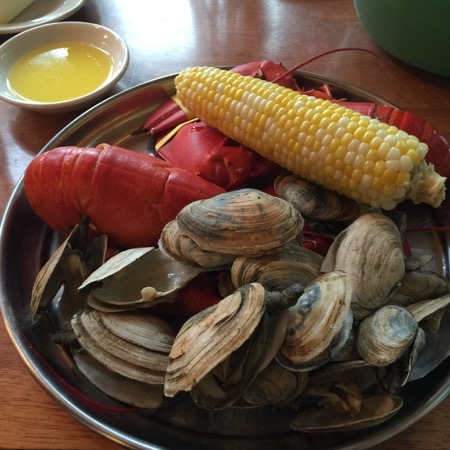 Every Friday during the months of June, July and August, the lodge offers an opportunity to buy into their “lobster bake”. If you know me, you guessed right, I jumped at the chance and it was awesome. I had two lobsters, a pound of steamers with butter, corn on the cob, home-made bread and dessert. Oh my goodness, It was awesome! If you have never experienced this Maine tradition, you owe it to yourself to participate. I actually drooled a little while typing this, I cannot wait to do this again next year. How was the fishing? I will tell you we stopped counting around the 50 fish mark. I never catch that many fish, I have had good days and bad days, but to catch fish all day long was just awesome. Most fish were decently sized, imagine the damage we could do if we actually knew the body of water? Which brings me back to the other folks staying at the camp. Every one of them gave us tips on what to use and where to go on the water and they were spot on. Not only were they helpful, they actually broke out maps and told us where else we should go fishing in the area outside of the camp. If you are not familiar with Lincoln, Maine or Smallmouth bass fishing, It’s time to add a trip here to your bucket list. Do yourself a favor and Google “fishing the Penobscot River”. I was told there are days that you catch a fish with every cast and that 50-60 fish days are possible and that is with just wading the river on your own. When we go up next year I am going to employ the services of Justin and get a guided trip on the Penobscot river. I spoke with another father and son combo that were staying there, and they told me they do the guided trip every year they go up and that they have been doing it for 4-5 years now. The idea of having someone knowledgeable deal with the boat and navigation while we just focus on catching fish sounds very appealing to me. If you are interested in reading our actual fishing report up at Eagle Lodge and camps, click here. If a true Maine fishing experience is in the cards for you, I highly recommend you check out Eagle Lodge and Camps. Steven and I want to personally thank Justin and Loraine for an awesome experience, and that we already have plans for a trip (possibly two) to the lodge next year. 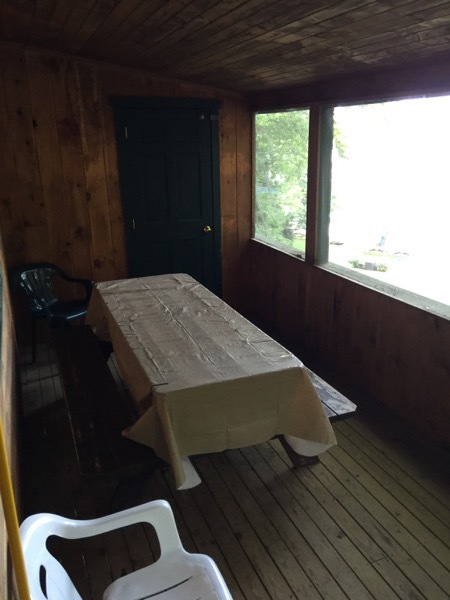 Maybe one day we will fill the lodge with a bunch of Tin boat members for a get together and friendly tournament………. That is AWESOME to here that there are still places like this around. It brings back many memories of trips to Canada with my father. Just him and I for two weeks every other year. Mom wanted us all together the other off years. Who knows you may have just started a life long family tradition. It will be incredibly cool if 20 years from now your son invites you to go because of the memories he created with you.